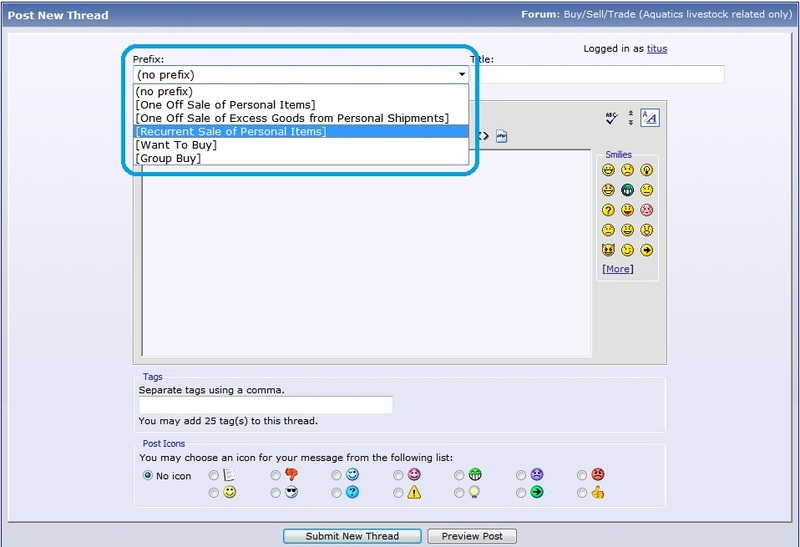 Every new thread posted in either of the Buy/Sell forums for livestock or hardware must have a Prefix selected to indicate the nature of the thread. In order to further the hobby and encourage captive propagated corals, Canreef will allow frag sales by hobbyists under these conditions; Seller must not be a business related to aquarium trade Seller does not have a website where inventory can be ordered online Frags must be grown by the seller Seller will not regularly sell other items in a "basement business" fashion, ie; no home made equipment, fish, etc Seller will not post corals that were purchased for the purpose of fragging to generate a profit (no chop shopping) Seller will, upon request, provide proof to staff that all frags are home grown. This can be verified by photos of frag tank, encrusted corals, etc, as deemed appropriate. Seller can ship frags enabling the spread of quality frags across the country. Seller has no limits on frags, however it is expected home growers will be limited in volume and excessive sales will gain the attention of staff. Canreef reserves the right to remove any post that contradicts these conditions. All group purchases must be clearly stated to be so within the post (preferably in the title). Any solicitation of offers without stating to be group buys will be subjected for removal, warning, or banning without any notice. Sourcing directly from entities that are exclusively wholesale only is classified as business operation. One off solicitation of offers is allowed and must be posted in the Buy/Sell forum depending if it's hardware or live goods. Items must be aquatics related except cameras. Camera accesorries (incl lens and batteries) at this time are not allowed unless sold along with the camera body. If there are an abundance of identical items (too many snails ordered than what you need), posts to sell these excess items are permitted in the Buy/Sell forums. The post must be clearly stated to indicate such situation and we do not expect this to happen on a recurring basis. Any posts hinting the solicitation for inquiries, availability of goods or services will be subjected for removal. Due to the nature of this hobby, being a "commercial vendor" doesn't mean you have to have a brick-and-mortar storefront or even a website .. essentially anything brought in for the sake of inventory or the sake of sales themselves, is considered a commercial post. Our vendors pay a substantial fee for the privilege to use Canreef as a forum for advertising or selling and so therefore we have to enforce that commercial sales without some form of sponsorship agreement in place be disallowed. If you intend on becoming a vendor, we would be happy to have you on board as a sponsor of the site.